A Monasterboice mum of two will have an extra pep in her step when she takes to the start line in the forthcoming VHI Women’s Mini Marathon, having collected the keys to a brand new Nissan Micra. The big surprise was sprung by Nissan when Emma visited Elverys Sports in Dundalk to collect her race number. Jeanne McGann, Marketing Director, Nissan Ireland (left) and Kathy Endersen, CEO of VHI Women’s Mini Marathon (right) congratulate Emma McGovern from Monasterboice, Louth (centre) on picking up the keys to her brand new Nissan Micra. Emma won the new Nissan Micra after her name was drawn from the list of almost 35,000 women entered to take part in the VHI Women’s Mini Marathon. Emma is really looking forward to the VHI Mini-Marathon and is hoping to run the full 10km distance. “I started as a walker, but I’m running five kilometres at the moment. If I could do it without walking, that would be great, but I’ll enjoy it either way,” she said. “Nissan are delighted to congratulate Emma on winning the all new Nissan Micra which is one of the most stylish cars on the road. 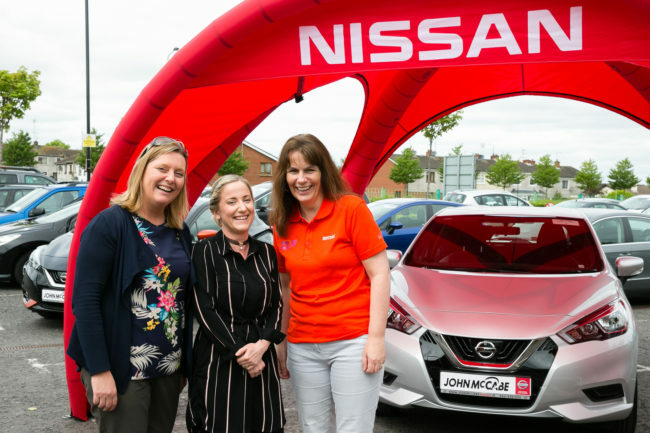 We look forward to seeing her at the start line on Monday and wish her many years of happy motoring as a new Nissan driver,” said Jeanne McGann, Head of Marketing at Nissan Ireland.